Bob Silvia inspected the damage at the Melrose home of Chris and Lisa McCormack. Bob Silvia pulled into the driveway of a wood-shingled Melrose home last week, and his eyes immediately darted toward the roof. He noted the barn-like slope, the snow pooled in the center, and finally the lip, swollen with ice, all the obvious signs of a bruising winter. 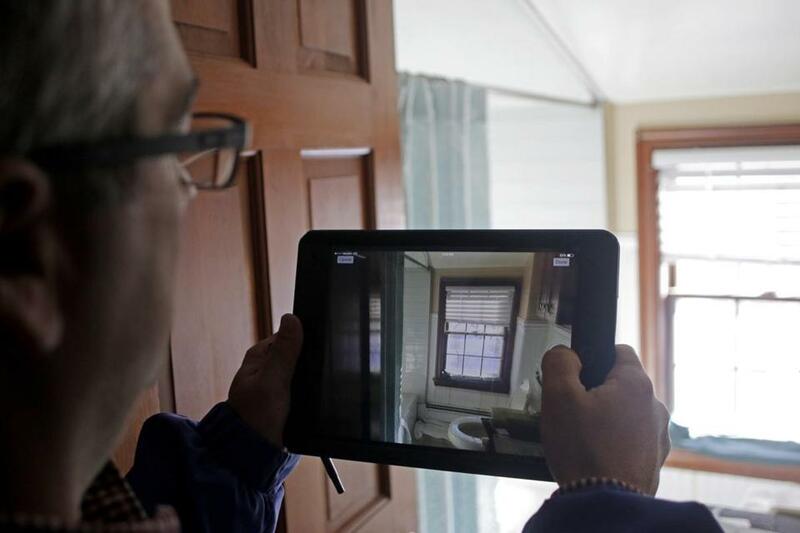 The 51-year-old insurance adjuster, who has walked through homes wracked by tornadoes, hurricanes, and fires, entered the two-story home of Chris and Lisa McCormack, sidestepping pots and buckets collecting a steady flow of water, and snapping photos with his tablet computer of ceilings marred by brown water stains. Silvia, who works for Bunker Hill Insurance of Boston, is among the legion of claims adjusters fanning out across Massachusetts as thousands of homeowners try to recover from the series of winter storms that have left record snow, persistent ice dams, and widespread damage. As with the region’s snow-plowing crews, roofers, and plumbers, adjusters are finding too much work and not enough people. That has meant 12-hour days for Silvia and forced insurance companies to seek reinforcements. Liberty Mutual has brought in adjusters from out-of-state offices. Plymouth Rock, which owns Bunker Hill Insurance, has hired contract adjusters, who bounce from one disaster to another, chasing the weather. 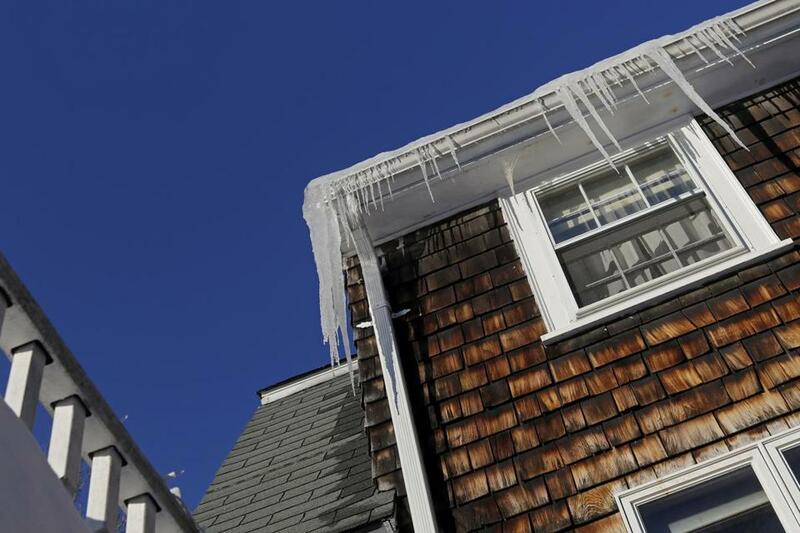 While some winters leave a trail of power outages and dented cars, this winter, as far as insurance companies are concerned, has been all about ice dams. These form when the snow loaded on the roofs starts to melt because of the heat rising inside of the house. While some winters leave a trail of power outages and dented cars, this winter, as far as insurance companies are concerned, has been all about ice dams. But as the water drains, it refreezes along the edge of the roof, and continues doing so, creating a dam. With nowhere else to go, the trapped water seeps under the shingles and into the house, leaking from overhead lights, between drywall, and around windows. “When I find a wet spot, I am overwhelmed,” said Lisa McCormack, who has lived in the wood-shingled home at the end of a cul-de-sac for 14 years. She never experienced a water problem — until this winter. At first, the McCormacks thought their roof was at fault. But after some Internet research, they realized it was an ice dam. Chris McCormack borrowed a roof rake from a neighbor and cleaned off portions of the roof. He spent four hours one day chiseling away at the ice buildup. He filled pantyhose with salt and tossed it up onto the roof, hoping it would melt the packed ice. On his first try, a pair of black hose landed in a nearby limb. It remains there. These efforts are helpful and can keep the situation from getting worse and more expensive, explained Silvia, the Bunker Hill Insurance adjuster. But it often comes too late, after the water has already trickled in and done its damage. Silvia advised the McCormacks to poke holes in their ceiling to help drain sitting water — before it is absorbed by the drywall or spreads further into the center of the house and the electrical wiring. Silvia expects to come back to the McCormacks’ place and many other homes he has visited because the full extent of the damage remains unclear. Contractors will have to test walls for dampness. In some cases, they must cut into walls and bring in humidifiers to dry out the insulation. There’s also the likelihood that as the weather warms, water frozen behind walls will begin melting and pouring into homes, said Frank O’Brien, a spokesman for the Property Casualty Insurers of America, an insurance trade organization. And as snow melts, and then refreezes as much heavier ice, it starts to weigh on roofs, so far causing about 100 collapses, according to the Massachusetts Emergency Management Agency. Insurers also are concerned about flooded basements if the snow piled high in yards and streets melts too quickly, O’Brien said. His organization has yet to estimate how much this winter will cost the insurance industry, O’Brien said. But it is unlikely to match the losses of 2011, when Massachusetts was hit by tornadoes, a tropical storm, and a snow and ice storm that downed power lines, O’Brien said. In 2012, companies sharply raised their homeowners’ insurance rates for customers across the state, to recover their losses. While the snowstorms have been frustrating and expensive for homeowners, Silvia said, they usually involve damage that can be repaired. Silvia, who has worked as an adjuster for 20 years, has dealt with house fires that not only destroyed furniture and rooms but also killed family members.